Pictures of me all dressed up! My new coat that my mom made for me. She just learned to sew, so she is making me clothes! 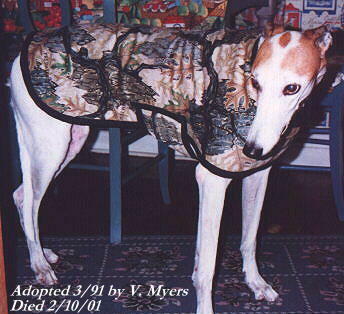 She made herself a matching fleece jacket, so she made me this neat red chinese print fleece jacket. It is reversible to a military camo print that matches my leash. 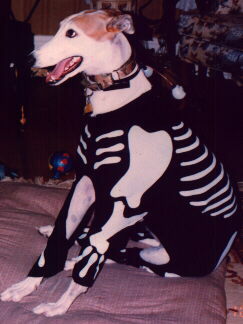 Here I am dressed in my Doggie Bones Halloween costume. My master has a matching costume. This is okay, but I don't like those little light up skulls she put on my head, so I shake them off all the time. Here is my master and me dressed as Devils. This is the costume we won a prize for. I'm supposed to be Devil Dog, Hound of Hell Cute, huh. Here is me in my black leather jacket with the eagle on the back. 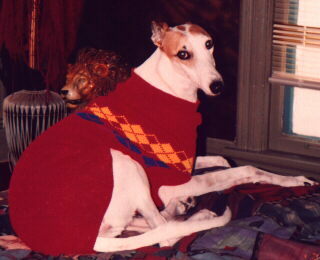 Here I am in my red sweater. I like my sweaters best. They are warm and don't have lots of snaps that come undone, like my coat has. 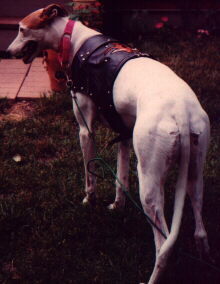 Then I have to stand around in the cold waiting for my master to refasten my coat.